All the pleasure and freshness with orange juice and pulp! An irresistible and unique flavour! Taste the ideal flavour for the warmer days! 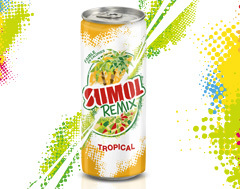 A mix that comes from the Tropics! An exotic and truly flavorful mixture. Orange juice drink (10%). Ingredients: Water and carbon dioxide, orange juice and pulp from concentrate, sugar, glucose-fructose syrup, acidity regulator: citric acid, flavouring and antioxidant: ascorbic acid. 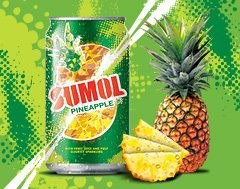 Pineapple juice drink (8%). Ingredients: Water and carbon dioxide, pineapple juice and pulp from concentrate, sugar, glucose-fructose syrup, acidity regulator: citric acid, flavouring and antioxidant: ascorbic acid. Passion fruit juice drink (6%). With sugar and sweetener. Ingredients: Water and carbon dioxide, passion fruit juice and pulp from concentrate, sugar, acidity regulators: citric acid, malic acid and sodium citrate, stabiliser: guar gum, flavouring, antioxidant: ascorbic acid and sweetener: sucralose. Apple, Mango and Guava Juice Drink (10%). Contains sweetener. 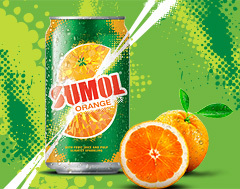 Ingredients: Water and carbon dioxide, apple juice (8,1%), mango juice and pulp(1,6%), guava juice and pulp (0,3%) from concentrate and orange pulp, acidity regulators: malic acid, citric acid and sodium citrate, flavourings, stabiliser: guar gum, preservative: potassium sorbate, antioxidant: ascorbic acid, sweetener: sucralose and carrot concentrate. 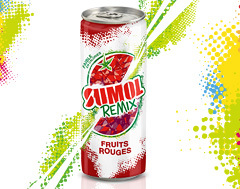 Red Fruits Juice Drink (10%). Contains sweetener. 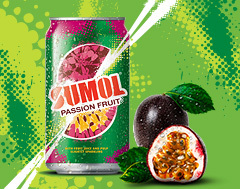 Ingredients: Water and carbon dioxide, red grape (4,7%), apple (4,3%), blackcurrant (0,5%), strawberry (0,3%), raspberry juices (0,2%) from concentrate and fruits pulp, acidity regulators: malic acid, citric acid and sodium citrate, flavourings, stabiliser: guar gum, preservative: potassium sorbate, sweetener: sucralose and black carrot concentrate.